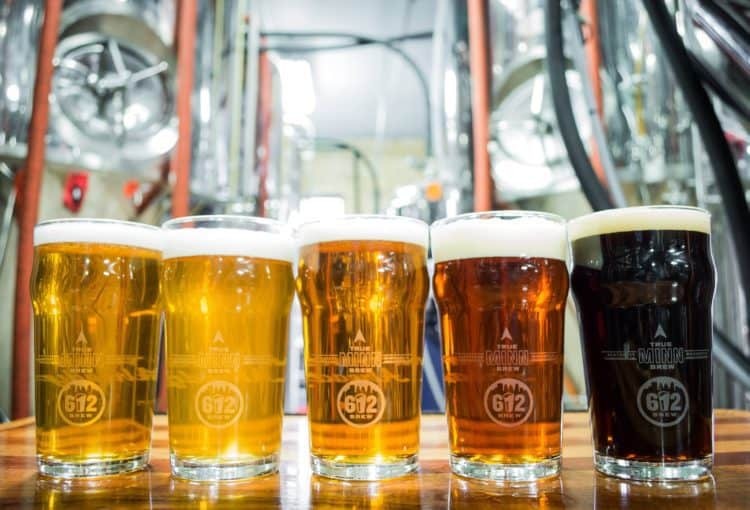 Whether you’re enjoying a casual weekday beer, or rocking out at a summer concert in our amphitheater, you’re bound to have a great time at 612BREW (pronounced six-one-two brew)! Located in the heart of Northeast Minneapolis on the corner of Broadway and Central in the building with the bright red chimney, you’ll be pleasantly surprised by their large patio space and eclectic selection of craft brews. The taproom, transformed from an old mattress factory into a state of the art brewing facility, features exposed brick and bright-colored murals and is the perfect place for a meeting with friends, a first date, or a celebration of any kind! 612 brews are generally hop forward with an eye towards balance and drinkability. With rotating seasonals featuring Belgians, lagers, and creative ales galore, they have a beer for everyone, from the craft beer connoisseur to the novice beer drinker. Open seven days a week, 612 would love for you to come check out some new beers, or try one of your old favorites with a friend! If you’re looking to hold a get together, then take a look at “The Cellar” for your next family or work-related gathering. It’s the event space at 612 that can host parties up to 50, with low room fees and beer minimums. They’ve hosted it all, from groom’s dinners and bridal showers to birthdays and business meetings.